They say imitation is the sincerest form of flattery. Dr Pepper, which has been growing in popularity, has amassed a large collection of imitators. This web page is devoted to all those beverages that tried to imitate the taste, the image, the style of Dr Pepper. Some came close, but none can surpass Dr Pepper, the nectar of the Gods. My growing collection of Dr Pepper rip-offs is featured in these pages. To see the description of a particular beverage click its icon on the menu frame. You will be treated to a picture of a container of that soda (a can if possible), a taste test of my own opinion, the company that produces that soda, the ingredients, and whatever other tripe I throw in. If you have a Dr Pepper rip-off that is not featured in this page, please mail me two cans, or at least tell me where it may be found. My goal in life is to taste test every rip-off, and for each soda to own a can and bottle of every size available. To start off, I will describe the king, the founder, the ruler of the soda world - Dr Pepper. It is by far the best soda ever produced. A pleasant and refreshing soda with bite - a little pepper, if you will. Best served in a frost mug with 6 or 7 ice cubes. 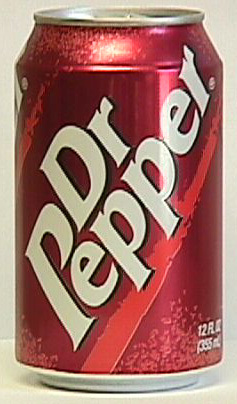 It is produced by the Dr Pepper Company, Dallas, Texas. Please don't e-mail me that it's made by Coke or Pepsi because you are stupid and I am the authority. The Coca Cola Company makes Mr Pibb (yuk), and I don't know if Pepsi makes a knock-off, yet. If you don't believe me then go look at a can. If you don't own any Dr Pepper then don't you dare ever talk to me, infidel. For taste I give it a perfect 10. All other imitators will be judged by this standard. Dr Pepper is the only drink to say "artificial and natural flavors" instead of "natural and artificial flavors." Weird. The 20 oz bottle is apparently extremely dangerous: WARNING CONTENTS UNDER PRESSURE. CAP MAY BLOW OFF CAUSING EYE OR OTHER SERIOUS INJURY. POINT AWAY FROM FACE AND PEOPLE, ESPECIALLY WHEN OPENING. What the hell? Not only is opening the bottle dangerous, but just the fact that the bottle exists is a threat to society? Does DP spontaneously combust? For safety's sake, just buy cans. This page written by Seth Kintigh in Netscape Composer, which is free, and it shows. Disclaimer: I'm sure taking pictures of cans and speaking my mind violates all sorts of US copyright laws. Feel free to sue me for a percentage of the $0.00 I make a year. The Dr Pepper Company, Dallas, Texas.